Wednesday, March 13th was shaping up to be a momentous pop culture day from the beginning. The night before, Colton Underwood defied logic, probable contract stipulations, and the laws of gravity after hopping over a gate to chase down his love, Cassie Randolph, and hand her The Bachelor season 23’s final rose. Oh, and he also, probably, most likely, lost his virginity. In the same breath (or, more accurately, two-hour televised special), word-fumbling Hannah B was announced as the next Bachelorette. Those of us in tune to Bachelor Nation—or really, any of us who have ever desired to waste time—waited for the reactions and the memes. They were going to be fire. I myself went to post a meme to the @betches Instagram at around 12pm. I uploaded a video, doing everything I normally do, and hit “share”. When the page redirected to my Instagram feed with a “sending…” progress bar loading at the top, I thought nothing of it. It would post to the feed momentarily, I thought. It always did. Except on Wednesday, March 13th, it didn’t. For reasons still unknown, Instagram went down, leaving users unable to post, like, or comment on any new content. It’s an outage that has since been dubbed the “Instagram Blackout of 2019”. Some (me) are calling it this year’s Fyre Festival. CNN reported users were also having trouble posting on WhatsApp, and, as I can attest from personal experience, Facebook. Facebook is aware of the issue on its family of apps, but has not yet identified a cause—though they did note the problem did not come from a DDoS attack, or an attack in which a hacker floods a site with fake traffic. So, for whatever reason, we missed out on a day of Instagram. It wasn’t the end of the world for most of us. We tried to post a few times, gave up, and quit the app. We begrudgingly went back to work. It was, more or less, business as usual—maybe even with a few less distractions. But if your business, as usual, is Instagram, if you’re making a living or even a significant side hustle off of the app, what then? I decided to ask a handful of Instagram influencers how they’ve been affected by the great Instagram Blackout of 2019. “That’s when I tried logging into a different account and had no luck with that one either.” Then, she says, “as anyone would do, I went to Twitter and searched ‘Instagram down’ to see if that was the issue.” At that point in time, the outage didn’t have a name yet—it was simply an error stopping accounts everywhere in their tracks. Carolyn Vazzana, author of Making It In Manhattan and the fashion blogger who runs @cvazzana, home to 226.1k followers, sensed the chaos to come the night before, on Tuesday night. “I first noticed something was up because I kept getting an error message every time I tried to comment,” she says. “Then [the next day] I noticed it wasn’t connecting and no new posts were showing up.” Vazzana realized the problem wasn’t unique for her, though, and that the whole platform was down. Instagram going dark can pose problems to influencers, with varying degrees of urgency. Vazzana says that not being able to post all day is “extremely rare”—she typically posts on her feed once or twice a day and uploads Stories on a consistent basis throughout the day—but admits, “I didn’t worry too much since it’s down for everyone.” She breathed a sigh of relief. Everyone was dealing with this. No way to coordinate photoshoots (because you failed to get someone’s phone number)? No way to promote your podcast? No sponcon?? That’s every influencer’s worst nightmare. It’s #millennialproblems personified. It’s easy to poke fun, but remember: it wasn’t just elite twentysomethings taking smiling-laughing-away photos who were affected by the blackout. It also came for our memes. Popular memer @sluttypuffin missed out on posting his usual 4-6 feed posts and 20-30 stories for the day during the blackout. That’s four to six pictures you could have laughed at and DM’d to your friends, or an average of five breaks from the crushing monotony of your desk job. Furthermore, he says he had “a few ongoing things” he was supposed to post for partners (another word for advertisers), but couldn’t. “I kinda chalked it up to being a sign from God that I needed to chill on Insta,” he says. Perhaps this was divine intervention, a message from above that we are, quite literally, doing too much on Insta. The platform is less than 10 years old, but it’s hard to imagine life without it. It’s just always there, an ever-present sidekick waiting with jokes, videos, and envy-inducing, perfectly posed “candids” for every occasion. When you’re on the toilet, Instagram is there to give your thumbs something to do. When you’re at your desk and your boss walks away for a second, Instagram is there to provide relief from work. When you’re the first one to arrive for a date, Instagram is there to help you pass the time so you’re not just staring off into space—or worse, alone with your own thoughts. So when it inexplicably goes away for an entire day, what do you do with yourself? For someone like Slutty Puffin, who’s used to spending anywhere from 3-4 hours on the app (“trust me, I have an alert,” he assures me), the prospect of filling a day without turning to IG can be daunting. It was bleak, he says, “having to look people in the eye, hearing the voices inside my head tell me I’m not good enough, not seeing puppies or models, having to stare at my own reflection in the mirror.” I shudder at the thought of it. No one should have to endure that. So he spent most of his day fielding questions from friends that Instagram was, in fact, down, as well as, “eating, actually focusing on my day job, and picking up a book for once” (he’s currently reading Bad Blood by John Carreyrou). Mind-blowing. Caroline Vazzana was all business, even without a central platform of her brand. “I was actually busy catching up on emails and writing for my site most of the day so I didn’t realize how serious the blackout was until later in the afternoon.” And for her, it’s less about any potential loss in revenue than it is about not being able to stay in touch with her followers— “I love being able to share with my community so I feel like I’m not able to connect with them because of the blackout!” Ever the optimist, she adds, “I hope it’s back up tomorrow, otherwise, maybe it’ll give me a chance to focus on some of my other platforms!” Oh, right. In all the post-apocalyptic frenzy, it was easy to forget that other platforms exist. Some weren’t as fortunate as Vazzana. “I actually had to work today. That’s all I gotta say,” says Lexi Stout, of @thelexistout. At 26.8K followers, Stout is what you might call a “micro-influencer.” Posting photos on the platform is not her full-time job, making the Instagram Blackout all the more crushing—she presumably actually had to interact with other humans in the wake of Instagram’s disruption. “The hardest part of not having Instagram was just the habitual opening and refreshing the app,” admits Dylan Farella, aka @dfarella. He adds, “It felt spacey.” Instagram is our right hand—or, more accurately, always in our right hand—when it’s cut off suddenly, without warning, it feels like a phantom limb. March 13 will always be the day we all hung out together on Twitter like the best friends that we are. As of 10:30pm EST on Wednesday, Instagram appeared to be more or less up and running again. 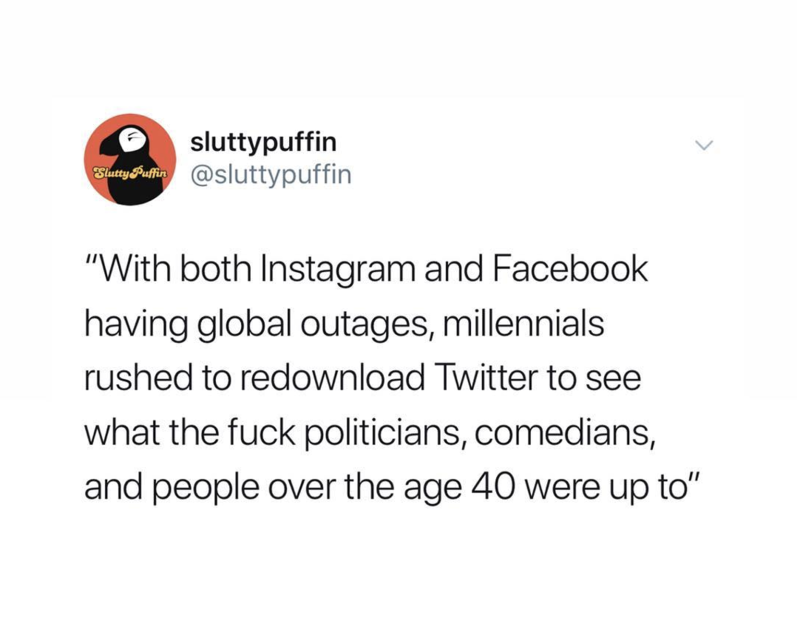 By this time, the outage had been dubbed “Instagram Blackout 2019”. Of course, the one thing on everyone’s feeds and stories once IG was back The very blackout we had just endured. Slutty Puffin has already posted two memes about it. So did Betches. Jeff Perla promoted his podcast. Alyssa Amoroso assured her followers in a Story that she is, in fact, alive, despite not being able to post. We were back on our bullsh*t.
Overall, nobody really lost out big—even those with commitments to advertisers in place were able to resume the next day. I got the impression from the influencers that, since the blackout affected everybody, advertisers understood and business was not really affected. “I don’t plan on doing so anytime soon!” Vazzana says of a self-imposed Instagram cleanse. Somewhere, through the screen of a computer that’s riddled with Trojan viruses downloaded from a phishing link, Baby Boomers are laughing at us. 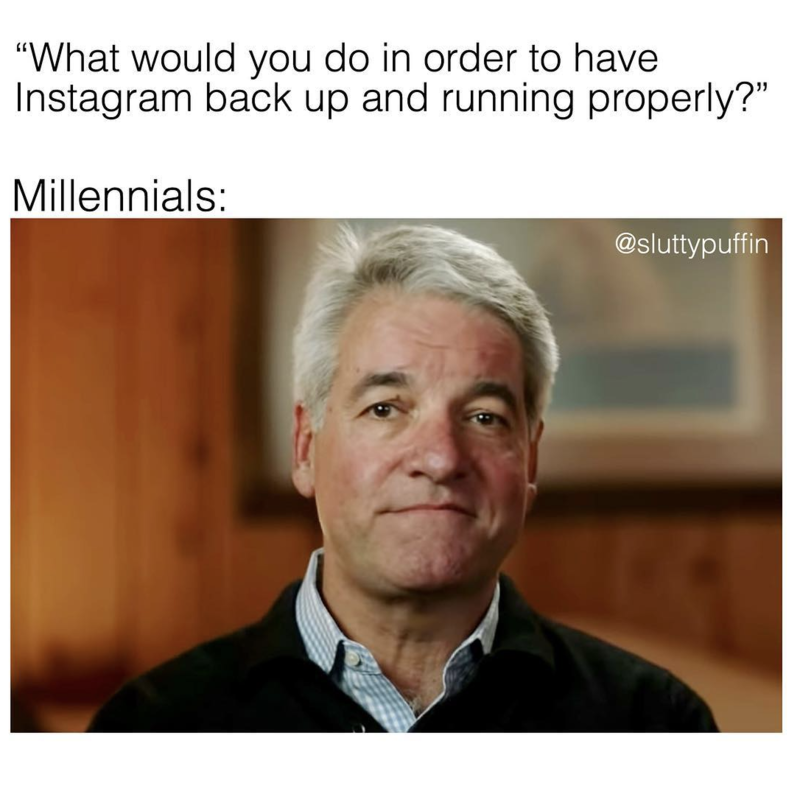 If anything, being forced to live a day without Instagram just reinforced that millennials can’t live without Instagram. The Instagram Blackout caused temporary pandemonium, with little permanent repercussions, and next to no resolutions to stop posting anytime soon. It was a huge event for the past 24 hours, but in a week we might totally forget the Instagram Blackout of 2019 even happened—it may go the way of the stabbing clowns of 2016, a strange cultural moment that happened, was memed, and then never spoken of again. Or, it might go the way of Fyre Festival, with two competing documentaries and endless reactions. It’s pretty much up to us how we will define the Instagram Blackout of 2019, or let it define us.